If you’re Job Seeker, then you must follow those Generic Cover Letter Tips which can helps you to get your desired Job without compromising your professional and academic attitude. Sometimes many students and professionals don’t follow the defined Generic Cover Letter Guidelines before submitting an application to multiple organizations. A perfect resume is one that must not be ruined by a poorly planned cover letter. 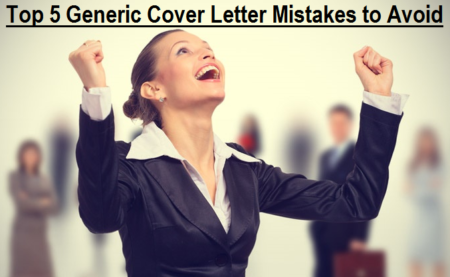 So in this blog post, you will learn Top 5 Generic Cover Letter Mistakes to Avoid for a Perfect Resume, which definitely helps you better sale your skills and talent to get your dream job and achieve success in professional life. 1. Wrong Input of Company Name: It’s a habit of most of the job searchers or professionals to submit multiple job applications at once, and while submitting a resume or curriculum vitae (CV), they often accidentally put the incorrect company or organization name on a cover letter, which is a big blunder. One shouldn’t forget to change company name before sending any job application with cover letter. 2. Length of Cover Letter: Length does matter here, typically any Generic Cover Letter characters length must be reasonable and short, one should not start writing an essay on cover letter, as it won’t be a professional cover letter, and a person who reads it will reject it on spot. The maximum cover letter length including headings must be short and point-to-point. 3. Redundancy: The main purpose of a Generic Cover Letter is to explain and present your past experience and hard work to the reader with all the important factors and elements of your skills and knowledge. One should not include any irrelevant things and must only describe relevant skills and applicable past experience in most professional way to avoid any negative perception on your personality. In short, you must avoid addition of an unnecessary information or detail. 4. Highlight Your Strength: Your purpose of writing a cover letter should be to identify the strengths, skills and talent that make you the best amongst the rest. so you must no focus or highlight your any of the weaknesses or negative things. Your prime focus must reflect your dedication and hard work towards your positive goals and achievements. 5. “I”, “Me”, “My”, “Myself”: Your reflection must be of a dynamic person who has strong hold on unlimited vocabulary, and not a victim of a limited vocabulary. So you must avoid the mistake of using “I”, “Me”, “My”, “Myself” repeatedly on your Generic Cover Letter. I repeat don’t repeat same words again and again, otherwise it will reflects your poor writing skills and abilities. In short, you must find a way of saying “I am the best” indirectly to complement your resume. Bonus Generic Cover Letter Tip: You must thoroughly check your spellings and grammatical mistakes after writing your cover letter, it must be your habit to proof-read your content before finalization to avoid any unforeseen cover letter mistakes. I hope all above mentioned generic cover letter guidelines will surely help you in professional career.